Since the Travis Roy Foundation began in 1997, your support has allowed our programs to grow, advancing medical research while directly impacting the lives of more than 1,400 spinal cord injury survivors and their families. I believe 2017 will be the year we look back on as the year the Travis Roy Foundation was first able to realize its full potential. We took occupancy of our first-ever office space at the Prudential Center in Boston at 101 Huntington Ave., hired our first full-time employee, and purchased the Little Fenway Complex, which hosts our largest annual fundraiser. The first of these meant that the Foundation and I no longer had to work out of a corner of my bedroom! We now have professional space where we can meet and greet the public, host Board meetings, and conduct the day-to-day business of the Foundation. Lisa Kielt came on board as our first full-time staff member and helped configure and maximize the use of our new office space. Lisa's previous experience working with nonprofits, her expertise with our newly acquired database, and her great organizational skills were exactly what the Foundation needed. The purchase of Little Fenway in Vermont was an unexpected opportunity. The owners, Pat and Beth O'Connor, gave the Foundation first refusal as part of their retirement plans to sell and move to Atlanta. While ownership was a major step for our relatively small organization, the Board felt acquiring the property was the right move. Much to the delight of our 32 WIFFLE Ball teams, the purchase of such a unique property, with three WIFFLE Ball fields, a three-car garage, and a four-bedroom house on ten acres of land, ensures the tournament will continue indefinitely. In 2017, the Foundation also strengthened our research programming by locking in three-year research agreements with Dr. Jeffrey Macklis at Harvard University and Dr. Jason Carmel at the Burke Institute. In addition, the TRF continued its sponsorship of the Big Idea electrical stimulation project that is being driven by the Christopher Reeve Foundation. Each year the progress being made in spinal cord injury research increases. The hope for a breakthrough is more real than ever, although, realistically, a "cure" is still many years away. I can tell you it's a lot easier living with paralysis knowing that significant gains are finally being made. While we wait for a breakthrough in research, the TRF continues to be a national leader in providing adaptive equipment grants to spinal cord injured survivors. I'm excited about the direction the TRF is headed. The opportunities that continue to fall in our lap amaze me, from the purchase of the Little Fenway Complex, to our first office space, to the hiring of our first full-time staff member. These pieces alone have drastically strengthened the ability of the TRF to take advantage of new opportunities as they come along. With the addition of these tools, the Travis Roy Foundation will continue to be able to increase our impact on providing a better future for spinal cord injured survivors and their families. Through it all, it is people like you who make these things happen. Thank you for your support and believing in the work that we do. Evicted from Travis' living room after 22 years, extraordinarily generous donors made it possible for the Travis Roy Foundation to move to a beautiful, ADA-compliant "official world headquarters." We took ownership of Little Fenway in Vermont, where our fabled WIFFLE Ball tournament has been going strong every August since 2002. Charity events achieved new fundraising milestones. All of this has created an even stronger Foundation to help others move forward. Each year, the needs of spinal cord injury survivors grow, and we are lucky to be able to count on growing fundraising support as well. With your help and participation, we are able to sustain our fundraising goals, and there are many fundraising events that bring our TRF community together for support and encouragement, and to help find a cure. Donors give generously all year round, enabling us to continue to grow and help others move forward. It's difficult to demonstrate our profound gratitude for their support. Each and every dollar donated directly impacts people who have spinal cord injuries. We sincerely appreciate and rely on the generosity of these individuals, foundations, and businesses-thank you to all of our donors! Our amazing group of volunteers is heavily involved in making the Travis Roy Foundation what it is today. The amount of work required to run a successful foundation would be impossible to accomplish without this team. We are eternally grateful for all they do. 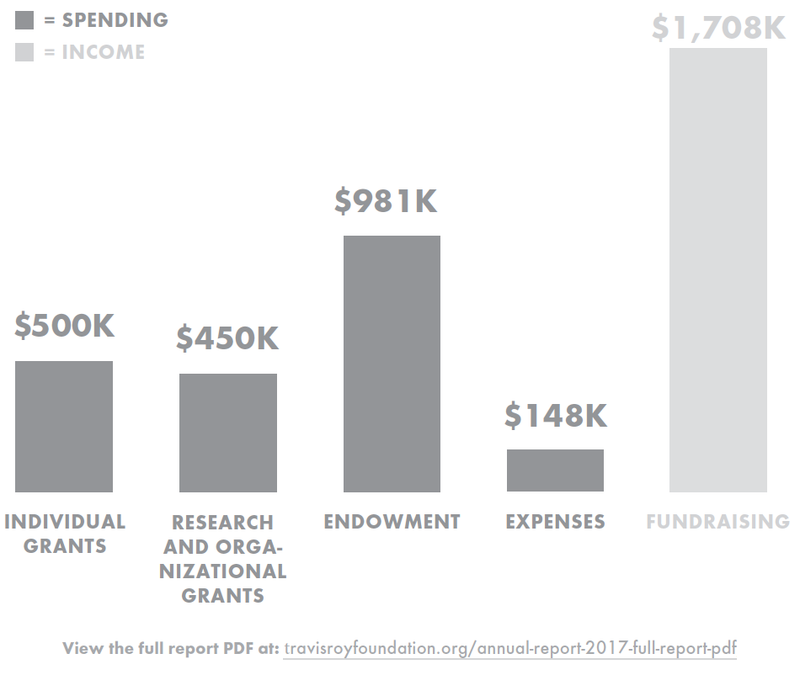 Third-party fundraisers are activities that are designed and run by individuals with minimal support from the Foundation. We are so fortunate that the members of the community choose to use their time and energy to help raise money for the TRF. In the past year, #TeamTRF has been the recipient of many third-party fundraising activities to help support those with spinal cord injuries-corporate jeans days, road races, a Junior Beanpot Skating Event, a hockey pool, bake sales, and more. The 16th year of our beloved tournament grossed more than $560,000 and delighted both new and returning members with a full weekend of good-spirited competition and community. Since 1997, 1,400 grants have been awarded in our Adaptive Equipment Program, with the value of goods and services adding up to more than $4 million. Over the years, our research grants have awarded $2.5 million to scientists working tirelessly to find a breakthrough in the world of spinal cord injuries. We believe that Dr. Macklis' lab's work with genetic modifications in neurons, the combined brain and electrical stimulation being carried out in Dr. Carmel's lab, and the intensive physical rehabilitation alongside electrical stimulation happening with participants in The Big Idea, will together produce outstanding functional improvements for people who have suffered spinal cord injuries.